How is it already ending? By inspiration from many other fabulous ladies, I think I’m going to attempt to do an ‘09 list. And I am not kidding about the last one – where would I be without you guys and this blog? OH MY GOSH!! LOOK AT THAT BAR WALL!!!!! That would be my heaven!! what store is that in!? 2009 was a whirlwind to say the least! Great least of "Bests" though.. I'm feeing inspired to possibly attempt one. ohh man! I'm lucky if my store has over 5 clif bars! My brother and I were JUST talking about how that's the best song in the world. Seriously, that's too coincidental. I definitely agree with your last decision! But I DO love me some Clif bars! do you play soccer?? i do and it was one of my biggest motivations to be healthy! Great list! 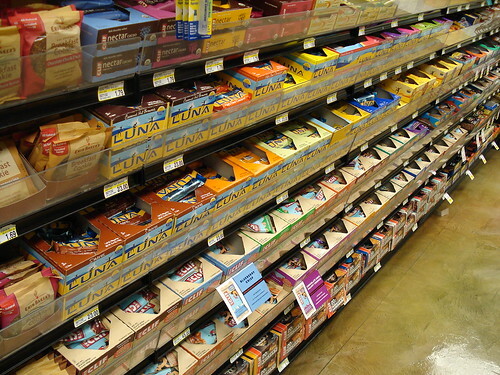 Check out that glorious aisle of bars..heaven! And the part about spreading your ashes over your blog-- too funny! Such a wonderful and heartwarming list Emily! I will do my thank you post tonight. Thanks for the inspiration. heres to a wonderful year!! and more wonders to come. Love your 2009 list. I might copy you in a future post! Luna bars are a staple in my life. I love them! This is my favorite post!!! I almost died when I saw the bar aisle...there Clif Nectar!!! I loved your best reward...happiness is the best feeling ever. And of course, we'll be two to have our ashes spread around the blogging world, lol. im so glad i discovered blogging this year too! OMG! Is that banana legit?! That is so cool. I just stumbled upon your blog and think it is wonderful. A beautiful blog. I love this post Emily. lovely tribute to '09. I have no doubt that 2010 will be even better for you, sweetie! Oh, that bar war = trader joe's, right? Love it. Have a very happy holiday, hope it's filled with wonderfullness.